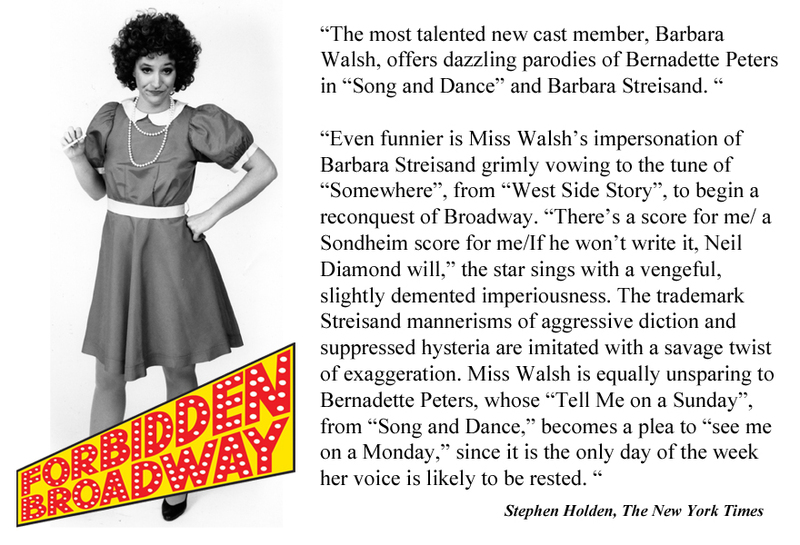 One of the easiest audiences to define is that at "Forbidden Broadway," a parody, takeoff, call-it-what –you-will of Broadway shows. The audiences are made up, not unusually, of both theatergoers and tourists, and their reactions are quite different. So says Barbara Walsh, one of the four stars of the recently updated revue. "Some of our timing depends on the audience response," said the 31-year-old singer who belts out, in Streisand fashion, a show-stopping song called "Someday." "We know almost immediately who is familiar with Broadway and Off-Broadway and who isn't." However, Miss Walsh added, the show has enough that is easily identifiable to satisfy even nontheatergoing visitors. 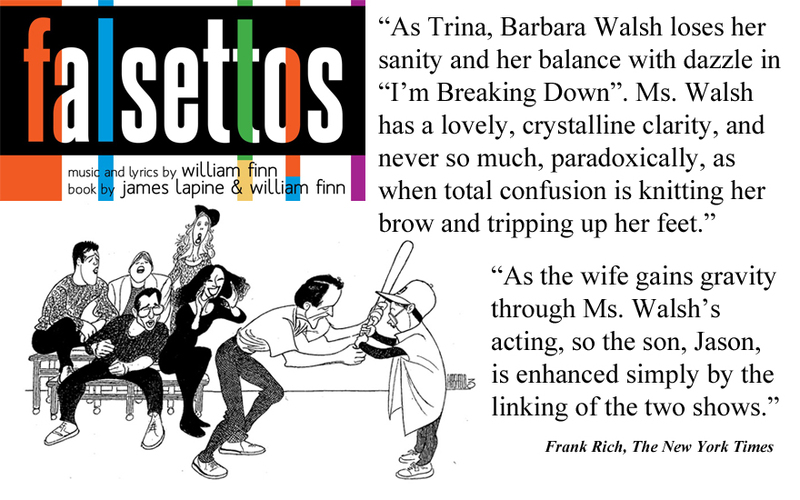 Among the subjects parodied, in addition to Barbra Streisand ("she owns the world," Miss Walsh said, sotto voce), are Bernadette Peters, Lily Tomlin, Mary Martin and" Singin' in the Rain." A native of Chevy Chase, MD, Miss Walsh said she knew from the time she was in high school, when she did impressions that cracked up her classmates, that she was not cut out for a nine-to-five job. She finished junior college, wrote her own act, took it into dinner theaters, played summer stock and regional houses, and went on the road with "Oklahoma!" before joining both the New York and national company of "Nine". But it's her present role that she hopes will "catapult me into a more solid career." In the meantime, she said, lie is never dull. Not too long ago, she spent six months as a waitress in a Middle Eastern café and now she's back on stage, full of hope that her career will continue its upward spiral. "In New York, if you can pay your rent and buy toilet paper, you're lucky," she said. "I'm lucky." 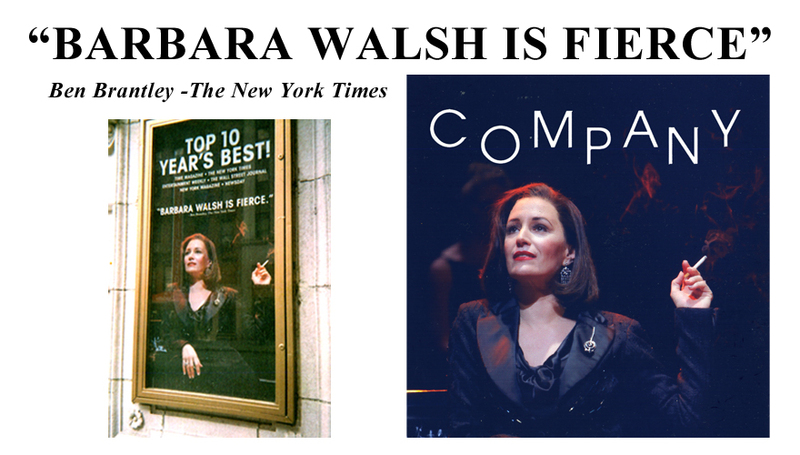 Barbara Walsh received critical acclaim and a Drama Desk nomination for her performance on Broadway as Joanne in the Tony-winning revival of Company, which was filmed for PBS Great Performances. She is best known for her Tony nominated performance as Trina in Falsettos for which she also received the Los Angeles Ovation Award and a Drama Desk nomination. Other Broadway credits: Hairspray, Big, Blood Brothers, Nine, Rock 'n Roll: the first 5,000 years, and Ragtime (Mother: Chicago company). Off-Broadway: Normal, 1,000 Words Come to Mind, Birds of Paradise, Stars in Your Eyes, Reading Under The Influence, and Forbidden Broadway. National tours: Oklahoma!, Les Misérables, and Chess (Carbonell Award). Regional: Master Class (Papermill Playhouse), Grey Gardens (Washington, D.C.'s Studio Theatre), 33 Variations (Capital Rep) A Little Night Music (Baltimore's Center Stage), Company (Cincinnati Playhouse), First Wives Club and Dinner With Friends (Old Globe Theatre), Creating Claire and The Sisters Rosensweig (George Street Playhouse), The Most Happy Fella (Great Lakes Theatre Festival), The Rhythm Club (Signature Theatre), and Blanche DuBois in A Streetcar Named Desire (Gretna Theatre). Film and television: Life With Mikey, Law & Order, Law & Order: Criminal Intent, and One Life to Live. CDs: Company, Broadway Unplugged, Big, A…My Name Is Always Alice, and The Best Of Forbidden Broadway. Married to director, Jack Cummings III.